Ross Padilla has a good eye. He captures a pattern with precision. It's not easy getting nature to perform its little tricks giving us eye candy to enjoy and explore. That's what I first thought of feathers when I looked at them. I couldn't believe the variety of expression within a single species. Their feathers look almost alike, but then like snowflakes you begin to see they are each special, unique and different from all the others. Reticulation in snake scales is quite a bit like the layering effect you get with feathers. I've written before that the ancient Egyptians gave me a focus on feathers. In their funerary art, they would represent layers of feathers overlapping like the scales in the image above. A molted feather you see above is a unique artifact. The Nikon captured image, more than a megabyte of information, was shed on the floor one fine afternoon. The Lacy Wyandotte donor was oblivious in the transaction which is the goal. Why should the chicken need to know? The feather rishi artist will take the plume and carefully clean it, inspecting it for flaws or imperfections that cannot be solved by the artist's bag of wizardry. Check the feather to the best of your ability to see if it's a protected species. It's sometimes hard to tell. Eagle can look very like turkey, for instance. 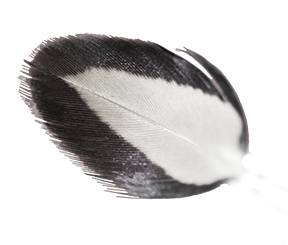 Here is an interesting link and discussion of legality in feathers. I've been away much of this year. You may know I am a full-time college student pursuing a masters in Art History. I take classes online and in institutions around San Diego, California. Building a new business while enrolled in college there is much to master. I wanted you to see one of my recent scarf creations: This is not an attempt to show a model shot, just an information picture with my friend Angie. I've chosen birds as my cause to cherish. There are so many causes, so much to cherish.